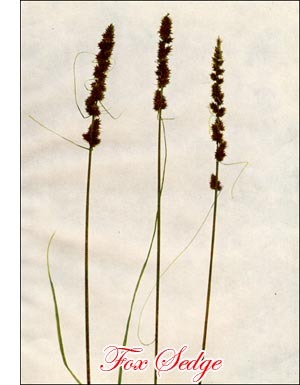 Sedges of this widely distributed genus grow in abundance in wet meadows, by brooksides, and in all swampy places. In a rich locality more than fifty species may be gathered in the course of a summer, and to the student these plants are more perplexing than are the grasses, since between many of the sedges the difference is too slight to be obvious save to patient study aided by good lenses. "Shear-grass" is an old English name for the sedges, and one that is most appropriate, since the leaves and stems of many species are sharp-edged and can cut sorely if carelessly handled. The plants of this genus are perennials, growing in tufts, and sending up many long-leaved, sterile shoots which, like the flower-bearing stems, are three-angled at the base. flowers are variously arranged: some sedges show spikes composed partly of fertile and partly of staminate blossoms, while in other sedges whole spikes are of one form of flower. The difference between the two forms is especially noticeable as the seeds ripen. The staminate spike is narrow and slender, but the pistillate spike increases in thickness with the ripening seed. When both forms are borne in the same spike that part which bears staminate flowers is slender and contracted, and the pistillate part, which is sometimes at the base of	the spike, sometimes in the middle, and occasionally at the summit, is swollen with seed, thus giving a ragged, uneven appearance to the inflorescence. The seed is enclosed in a sac, known as the perigynium, and the form of the seed is determined by the number of stigmas: when there are two stigmas the seed is more or less compressed, or two-edged, while with three stigmas the form of the seed is triangular. Each flower is protected by a scale, or bract, and a close observance of the form of the scale is of the utmost importance in determining the species. Brilliant colours are seldom found in this genus; the rose and purple which adorn the flower of the grass are lacking, and the blossoming spikes of sedges are of dull green or brown, while rarely is the base of the stem tinged in reddish.